office, home office, or SoHo arena. Plastic fiber available today is step index, which by its very nature limits the bandwidth available. Current designs are based on a material called PMMA, poly methyl methacrylate. 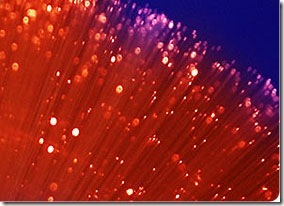 Step index plastic optical fiber, or SIPOF, today has a best bandwidth of 12.5 MHz.km and an attenuation of 180 dB/km. Compare this to the 500 MHz.km bandwidth and 1 dB/km attenuation available from 50/125 glass optical fiber. The manufacturing costs of PMMA fiber are thought to be about the same as for conventional glass optical fiber, but SI-POF currently sells at a premium compared to glass or all-silica fiber. The thermal stability of PMMA is also questionable. High temperatures combined with high humidity can raise the attenuation of the fiber significantly. SI-POF fibers are available in sizes of 500, 750 and 1000 micron total diameter. Most of this is a PMMA core with a thin layer of fluorinated PMMA for the cladding. Deuterated PMMA has been proposed as an advancement. It can reduce attenuation to 20 dB/km in theory but this has not been achieved in practice. Deuterated PMMA is also very expensive to produce. To really improve plastic fiber a graded index version has to be produced to overcome the poor bandwidth properties of SI-POF. Graded index plastic optical fiber, or GI-POF, offers the potential of 3 Gb/s transmission over 100 m and 16 dB/km attenuation at 650 nm. Even 1300 nm operation may be possible with next generation materials. GI-POF experiments have been undertaken based on a material called perfluorinated plastic, PF. PF fibers could have an attenuation as low as 1 dB/km at 1300 nm with a fiber of about 750 micron diameter and a 400 micron core. Perfluorinated graded index plastic optical fiber, PFGIPOF is available today offering a minimum of 50 dB/km around 1300 nm and 200 dB/km at 650 nm. For example, Lucina® from Asahi Glass, which has a 120 micron core and 500 micron cladding with a numerical aperture of 0.18 and a claimed bandwidth of 200 MHz.km. Manufacturers are aiming for 10 dB/km across the useable spectrum in the near future. Today plastic fibers are mostly used for illumination or very shortdistance communication systems, such as in a car. The main advantage of plastic fiber is ease of connectorization but it has yet to prove itself in terms of cost, bandwidth, attenuation and long-term thermal stability.